Mark your calendar now—the 5th Annual San Luis Obispo Jazz Festival is May 18-19 in the historic Mission Plaza. Tucked in the heart of Downtown San Luis Obispo, SLO Jazz Festival offers a mishmash of subgenres from mellow jazz harmonies to high-energy bebop rhythms, which are sure to get you on your feet. SLO Jazz Festival will consist of over 20 performing acts across 5 stages. Artists and performers range from Grammy Award winning Poncho Sanchez, to the local college and high school performers of the SLOMA and Children’s Art Museum Stage. 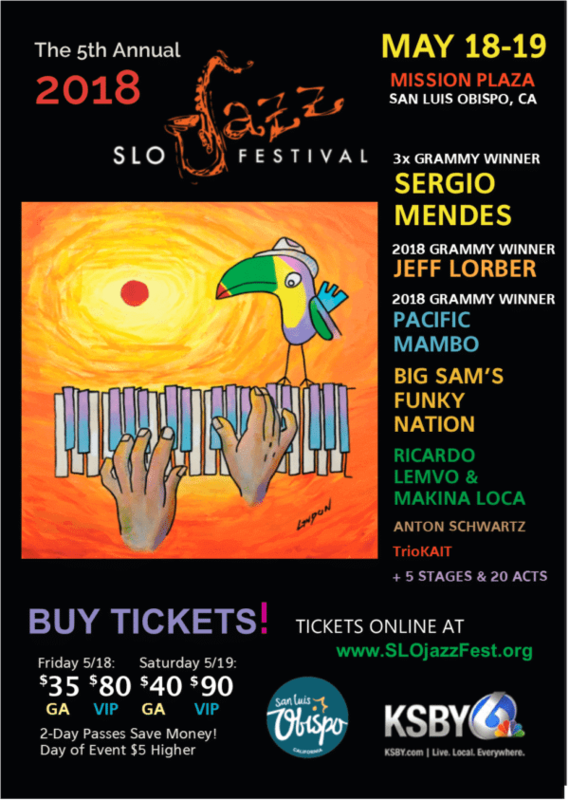 Proceeds from the event benefit SLO Jazz Festival, a non-profit dedicated to celebrating and continuing the tradition of jazz music throughout the Central Coast. Mission Stage (Main Stage): With Mission San Luis Obispo de Tolosa as its backdrop, the 5th Annual SLO Jazz Festival’s Mission Stage will open with Kait Dunton’s TrioKAIT and Jazz Sax Man Anton Schwartz. The Main Stage will also feature 3x Grammy Award winning Sergio Mendes, Big Sam’s Funky Nation, and Afro-Cuban Salsa artists Ricardo Lemvo and Makina Loca. Broad Street (Nola Stage): Located next to the History Museum of San Luis Obispo County, this year’s Broad Street Stage will feature a range of styles from the Ragbone Saints’ Second Line flavor, to the Dixieland Jazz of the Pubcrawlers. By popular demand, Boogie Stomp will once again be performing at the Nola Stage as well. Oddfellows Hall (Jazz Lives Stage): Located on Dana Street, this stage is brand new to the festival. The Jazz Lives Stage will showcase the Anton Schwartz Quintet, contemporary Fusion Jazz from the Joe Duran Band, and a host of other local jazz stars. Youth in Music Stage: Playing in the SLO Museum of Art, the Youth in Music Stage will feature the finest jazz performers from high schools and colleges throughout San Luis Obispo County and more. Youth in Music II High School Band Stage: Various high school jazz combos will play their best tunes at the SLO Children’s Museum throughout the day. When planning your visit to San Luis Obispo for SLO Jazz Festival, don’t miss out on the endless things to do along the Central Coast. 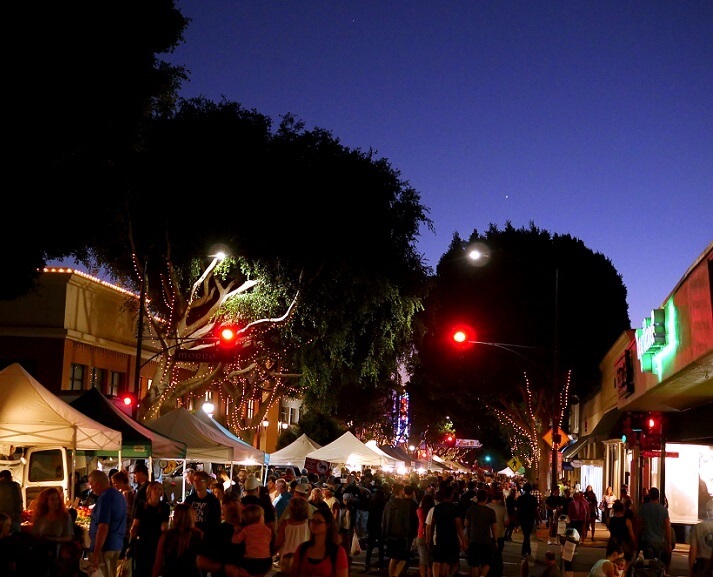 Farmers’ Market: Attend the world-famous San Luis Obispo Thursday Night Farmers’ Market for delicious eats, live music, and a leisurely stroll through downtown. Shopping: Peruse the local shops and unique art galleries around town. Outdoor Adventure: Enjoy the scenic surroundings by hiking one of the peaks, saddling up for a horseback riding adventure, or relaxing at the beach. 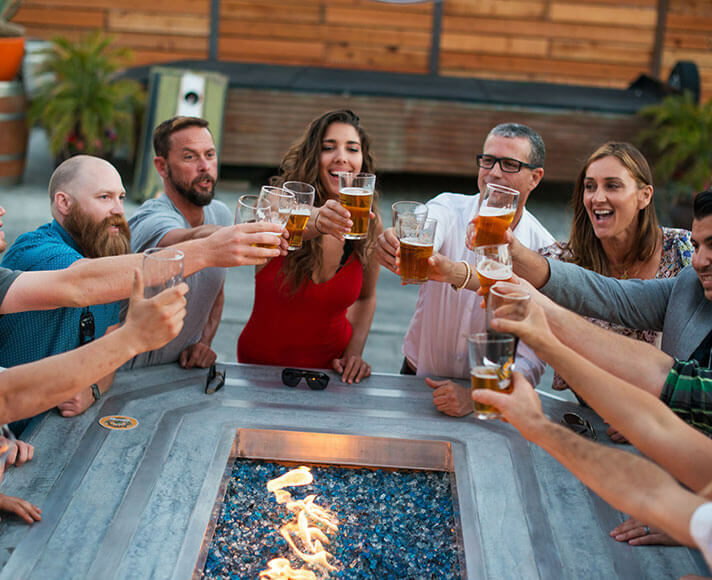 Beer & Wine Tasting: Experience San Luis Obispo’s up-and-coming craft beer scene by traveling along the SLO Beer Trail, or sip your way through Edna Valley. Delicious Eats: Get a taste of San Luis Obispo at one of the local restaurants, featuring farm-to-table plates and delicious drink concoctions. To purchase tickets, get more information and view a full schedule of events, visit the SLO Jazz Festival site today!